William Stern, my friend of 20+ years and business partner, will appear on Bravo’s Millionaire Matchmaker TV show Thursday, September 8. Read and see a preview of the episode here: http://www.bravotv.com/the-millionaire-matchmaker/season-5/episode-4-mamas-boy-meets-southern-gentleman. It’s Hollywood, so judge accordingly. As Labor Day approaches, the school year is off to the races. Pardon my ignorance, but I figured this out standing in line at Rite-Aid this weekend. There were throngs of kids buying pencils, backpacks, and colorful folders. I just wanted a diet coke, but their angry parents wouldn’t let me cut in front of them. We recently moved to the suburbs for the first time in our adult lives and it turns out “back to school” is quite the local event. As family vacations come to a close, Labor Day coincides with investors getting back to serious business each year. Sadly, this holiday is the brain child of labor unions in the US. Over a century ago, our government gave in to jealousy of foreign communists. I enjoy my day off, so I won’t complain all that much. The markets have found some solid ground to stand on over the past week and anxiety significantly subsided. That doesn’t mean the roller coaster is over. But chances are, market action will pick a direction fairly quickly and move with conviction. While we wait for this to happen, a few headlines piqued my interest today. One of America’s serious economists writes serious nonsense here: http://www.tnr.com/article/economy/94275/shiller-infrastructure-debt-stimulus. Why would he advocate raising taxes, then spending the funds on some sort of government labor pool? I guess Dr. Shiller thought he would put a new twist on Keynesian economics, but this just sounds crazy. Dropping money from helicopters on the masses would be a better solution to our current economic malaise. Our private sector needs direct stimulus, not a new bureaucratic spending program. Regardless, I don’t know any out of work mortgage brokers or car salesmen ready to pick up a shovel to dig ditches. They would rather collect unemployment. This story shows how the economy is healing itself in new and interesting ways: http://www.bloomberg.com/news/2011-08-30/grandma-bunks-with-jobless-kids-as-multigenerational-homes-surge.html. Nobody likes living next to a multi-generational (communal) home with six cars in the driveway. But people do what they must to survive. Ironically, the communal living concept comes to us courtesy of communist states like China and the former USSR, just like Labor Day. Some very bright men opine on the Euro’s future here: http://www.bloomberg.com/news/2011-08-21/el-erian-joining-feldstein-fels-on-prospect-of-euro-evolving-into-new-core.html. If you want to be part of a union, strong partners must support weaker partners in times of need. Partners in a union also work out compromises when they disagree. Kicking the PIIGS (Portugal, Italy, Ireland, Greece, Spain) off the Euro currency presents a real potential shock to global markets and at this time the EU will likely sidestep this immense policy blunder. To put this issue in perspective, most US citizens would love to be rid of “housing bubble and illegal immigration” states like Florida, Arizona and Nevada. I leave out California because it’s simply too darn big and important to the US as a whole. You could argue the “parasite” sates are dragging the dollar down with big budgets, falling tax revenue, and localized economic problems the folks in Illinois and Virginia just don’t care about. You can see how this argument can quickly turn to political civil war and roil markets. Warren Buffett’s tax rhetoric gains supporters: http://economix.blogs.nytimes.com/2011/08/23/what-the-rich-can-afford-in-income-tax/. Bruce Bartlett is a conservative guy when it comes to economics. Why is he talking about tax increases for the rich at a time when populist headlines are all the rage? I won’t discuss the specific merits of his argument, but opening yet another pitch fork stand for angry villagers doesn’t seem like a great idea. It is important to note that changes in the tax code represent a shift in the distribution of wealth–markets get depressed when this happens, no matter the direction of the shift. Losers hate losing more than winners like winning: that’s basic behavioral economics. So ridiculous, it’s worrisome: http://www.marketwatch.com/Story/story/print?guid=CF3F1872-CCE9-11E0-BE2D-00212803FAD6. The future is always scary, I agree. Human civilization will successfully deal with the challenges a more populous planet Earth presents. We are capable of immense innovation at an exponential rate relative to what we believe is possible today. Gloom and doom stories like this about post-apocalyptic investment ideas are about as useful as umbrellas at Chernobyl. if you feel inspired, don’t log into your Schwab account. Go out and buy a Nissan Leaf with some roof-mounted solar panels. Volatility is back in equity markets today and headlines point to slowing economic growth across the globe. First, the market is a discounter of known information. If you understand that, you know GDP revisions by analysts and the same old stories about high unemployment don’t move stocks. Second, volatility is normal; it’s why stocks earn a premium over other asset classes over time. But guessing why stocks do what they do any given day is best left to fortune tellers. Let’s take our eyes off today’s bleeding ticker and focus on economic data from the World Bank and IMF. Apparently European economic growth slowing may be contagious to the rest of the world. The 27 nations of the European Union (EU) are no poster child for growth and haven’t been for a very long time. 2001-2010 EU real GDP growth was a “massive” 1.18% on average. The trend doesn’t look good when you look at prior decades: 2.14% on average during the 1990s, 2.38% during the 1980s and 3.03% during the 1970s. To provide some perspective, Asia ex-Japan and Emerging Markets GDP expanded 7.06% and 5.75% 2001-2010, respectively. The US posted consistent showings in the low 3% range during the 70s, 80s and 90s. US real GDP grew just 1.64% on average 2001-2010. Economies can slow during expansions just like a stock can take a step back before heading to new highs. Worries over the European Union’s economy are not new and add little credibility to global recession/depression fears. Equity investors should build portfolios with powerful global exporters in mind. This will help minimize exposure to structurally slowing economies and maximize exposure to the new engines of economic growth. 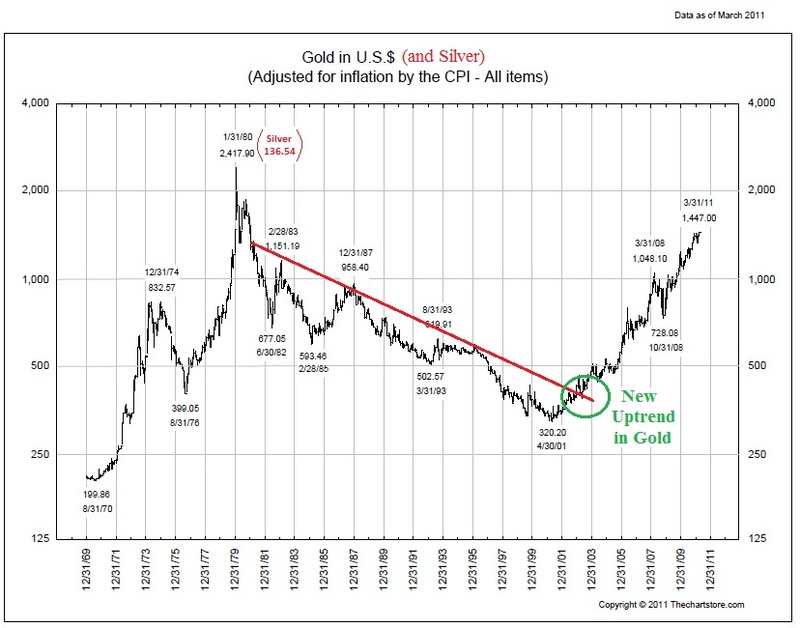 Richard Salsman’s dog and pony show for a return to the gold standard: http://www.forbes.com/sites/richardsalsman/2011/08/16/gold-reagan-and-the-reds-from-degraded-dollar-to-downgraded-debt/3/. Life is immitating art: remember the movie “Lord of War,” where the African dictator asks the arms dealer character played by Nicholas Cage for a solid gold machine gun? The 007 series also comes to mind with a shadowy New World Order set to control the globe’s currencies and natural resources. I say ask the Treasury Department to hold endangered species as collateral for currency. I think the dollar is worth its weight in black rhinos, giant pandas, and beluga sturgeons. Caviar is the new black gold. http://www.realclearmarkets.com/articles/2011/08/17/gov_rick_perrys_red-hot_bernanke_slam_99198.html. A blurry picture is forming of the 2012 competition for leader of the free world. Governor Perry says “Printing more money to play politics at this particular time in American history is almost treacherous, or treasonous, in my opinion.” Mr. Perry is certainly no economist. And Mitt Romney reminds me of John Kerry with a more obscure religious profile. Doesn’t look like Barak and Michelle need to worry about packing up just yet. Whether you approve of the President’s performance or not, Mr. Obama is more camera shy than he was during his first year. What has he accomplished so far? I recall something about healthcare reform and a promise to pull back from global conflicts; and oh yeah, he said he would fix the economy and create jobs. http://www.nytimes.com/2011/08/17/opinion/why-we-should-end-homeownership-subsidies.html?_r=2&ref=opinion. The NYT proposes we kill GSEs Fannie and Freddie currently financing the vast majority of US home purchases at a time when private investors want to sit on the sidelines. Let’s assume these are good ideas. Unfortunately, stories like this are used by nasty politicians to argue for crazy notions like removing mortgage interest as a tax deduction. This article says GSEs cost $700 billion in lost revenue over five years, whatever that statistical mumbo jumbo means. That is the tiniest of fractions in relation to our aggregate spending on the military industrial complex. Where would you rather cut? http://www.nakedcapitalism.com/2011/08/bank-of-america-death-watch-unloading-non-core-assets-aggressively.html. This story would not be worth discussing were it not for what transpired in the US financial sector over 2008 and 2009. Words sometimes equate to Chinese water torture. Each word holds little weight, but add them up over time and Bank of America could end up in the hands of a competitor for pennies on the dollar. There are only seven and a half dollars left as of this writing, so caveat emptor. This is not some gloom and doom prediction, but confidence is key to market stability. Just remember that Wall Street is even better at spreading rumors and manipulating feelings than making money and political contributions. August 10 I wrote the topic of Japan has died down in the media of late: http://www.cardiffassetmanagement.com/blog/2011/08/10/japan-part-deux/. It’s back with a vengeance. Here’s a good article about structural issues faced by the Japanese economy relative to the US economy: http://the-diplomat.com/2011/08/17/no-the-us-isn’t-japan/. Please ignore all rhetoric on US financial regulation. Yesterday’s post Sector Weights and Limo Drivers provided a quick look at the hidden strength of middle class America. On a same-store basis, Macy’s, Inc.’s (Public, NYSE:M) second quarter sales were up 6.4 percent. Today, let’s look at three additional beacons of the middle class: Brinker International, Inc. (Public, NYSE:EAT), Darden Restaurants, Inc. (Public, NYSE:DRI), and CarMax, Inc. (Public, NYSE:KMX). Brinker is better known to you as 1,550 restaurants, mainly Chili’s. Darden represents 1,894 restaurants, mainly Olive Garden and Red Lobster. And CarMax operates 103 used car superstores in 49 markets. The restaurant story is simple and that’s always best. These stocks are beating sales and earnings growth expectations and more importantly outperforming the S&P 500 year-to-date and trailing 12 months. Regular, working folks are voting with their feet by leaving the kitchen and lining up for a table at a nearby strip mall. CarMax is a bit more complex. Its outperformance of the S&P 500 isn’t all about the strength of used car sales versus new car sales. The economy would certainly be stronger if consumers showed a greater willingness to buy new cars. But given the success CarMax is seeing, let’s not get mad. My firsthand experience with this business was nothing short of amazing. A few weeks ago I walked into a local San Diego CarMax. I wanted to sell them my used car or at least get a reasonable quote. I came ten minutes after they open doors on a random Wednesday. I expected to wait another ten minutes for the appraisal. After being greeted by a friendly member of the staff and explained the no haggle process, I knew things weren’t looking good. The place was packed to the gills! I had to wait for 45 minutes for the appraisal to be completed. Was I angry? No, I was amazed. This business is successfully putting the shady used car lot out of business. I would never buy a car there because they mark them up 20-30% over wholesale, but lots of people do. The sales folks are friendly, the process is simple and the selection of cars is huge. They keep margins high by taking the haggle out of the deal, offering three simple financing options at point of sale and paying just commission to most “sales” folks on their floor. I chatted with a few folks and you will find remnants of the mortgage industry, new car dealers and other now-defunct industries in the CarMax HR files. It’s amazingly rare to get an indepth look under the hood of a business from a single visit like this.